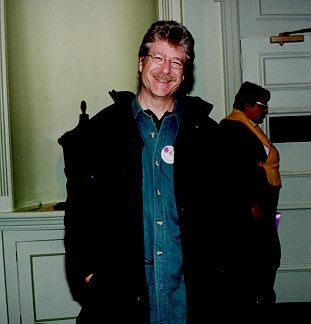 Vice-Chair of the Charlottesville Democratic Committee (Picture of Russell Perry taken on December 31, 2000 at First Night Virginia 2001 in Charlottesville, Virginia). I am a three time resident of Charlottesville: once as a child, once as a college student and once as a husband, small business man and parent of three children. I became a Democrat during the 1960 Presidential campaign. My recollection (remember - I was 6 and this was probably an off-hand remark) is that my father told the family that if Richard Nixon won, we would have to leave the country. He didn't and we didn't. In fact we came to Charlottesville instead (in 1964), where I may have had my first experience with integrated schools. We came from Goochland Courthouse, VA, which was pretty far out in the country then. I remember a trip to Richmond being a topic of local conversation. We were introduced to Charlottesville through the community of St. Paul's Episcopal Church where my father (Rev. Charles Perry) served as Associate Rector. This lead to the formation of long-term family friendships (Roach, McGuire, Snook, Scott, Spaar, etc.) of the sort that caused my parents (Charles and Joy) to retire to Charlottesville from Berkeley, in 1995, after being gone for 27 years. Of singular note ... during my childhood, we lived next door to Earnest and Sally Mead. You would have to check to be sure, but I think Francis Fife was the Mayor (could that be?) during that period. I went to Venable and then to Jefferson on a half day schedule the year that the new Junior High Schools were not finished. Eventually, I was one of the first three classes at Walker in 1968. We left town before I started at Lane, but my sister, Dana, and I would have been in the class of 1971. I returned to Charlottesville to attend Architecture School, after an interview with Harry Porter, later to be the Dean, that was a real turning point. I spent a good deal of my college life involved in the local music scene, serving a spell as the Station Manager of WTJU, promoting the occasional concert and generally getting to know all the musicians and bars. The most important thing that came of my four year stay at the University was meeting Jeanette Rosenberg in my first year. We later married, the smartest thing I ever did. After Graduate School, Jeanette and I moved to Washington, DC. In 1993 and 1994, we became active in the reform candidacy of our friend Kathy Patterson for City Council from Ward 3. Kathy upset an 2-term incumbent, won the Democratic nomination and was elected to Council in November 1994. After 16 years in practice in Washington, DC, Jeanette and I returned to Charlottesville at Christmas 1994, when I formed a new architectural practice with William McDonough and Chris Hays - William McDonough + Partners. In the past six years, we have had (or still have) children in Venable, Greenbrier, Walker, Buford and CHS. My entry into Charlottesville politics came with Maurice Cox's initial candidacy for nomination by the party to City Council, in 1996. Around that time, I became the co-chair of the Rivanna River Basin Roundtable, an initiative of Nancy O'Brien and the Thomas Jefferson Planning District Commission. Work in the field of water resources led me to get to know many of the party leadership and encouraged me to take a very active role in the nomination process for City Council in winter 1999 - spring 2000. I participated in the fascinating and uplifting platform building process with the Democrats for Change and went on to take a major role in the successful campaign for Meredith Richards, Maurice Cox and Kevin Lynch. After participating in my first national general election in the fall of 2000, I was pleased to be elected to lead the Charlottesville Democratic Party with Lloyd Snook, Shirley Cauley, Erin Garvey and Richard Merriwether. 1. What is your greatest fear? That we wait too long to grapple with the profound environmental challenges before us. 2. What is the trait you most deplore in yourself? Failing to truly appreciate the other side of an argument. 4. What is your favorite journey? Summer with the family in Vermont. 5. What do you consider the most overrated virtue? Caution. 6. What do you dislke most about your appearance? My hair is getting gray, how did that happen? 7. Which living person do you most despise? Jesse Helms. 8. Which words or phrases do you most overuse? "Sort of", it's so imprecise. 9. What or who is the greatest love of your live? Without question, JeanetteRosenberg, followed closely by my children, Daniel, Hannah and Julia. 11. What do you consider your greatest achievement? Flourishing as an architect (it's a tough business). 12. What is your most treasured possession? The love of my family. 13. What do you regard as the lowest depth of misery? 12 years of Reagan/Bush. 14. Where would you like to live? Right here, for the third time. 15. Who are your favorite writers? Wendell Berry, Peter Guralnik, Wallace Stegner, Aldo Leopold. 16. Who are your heroes in real life? David Orr, Rachel Carson. 17. How would you like to die? At home, with my family, with sufficient notice to put things in order. 18. What is your motto? "When the going gets weird, the weird go pro." -Hunter Thompson. 20. What is your greatest regret? That I did not become a field biologist. 21. If you were to die and come back as a person or thing, what do you think it would be? Alive.